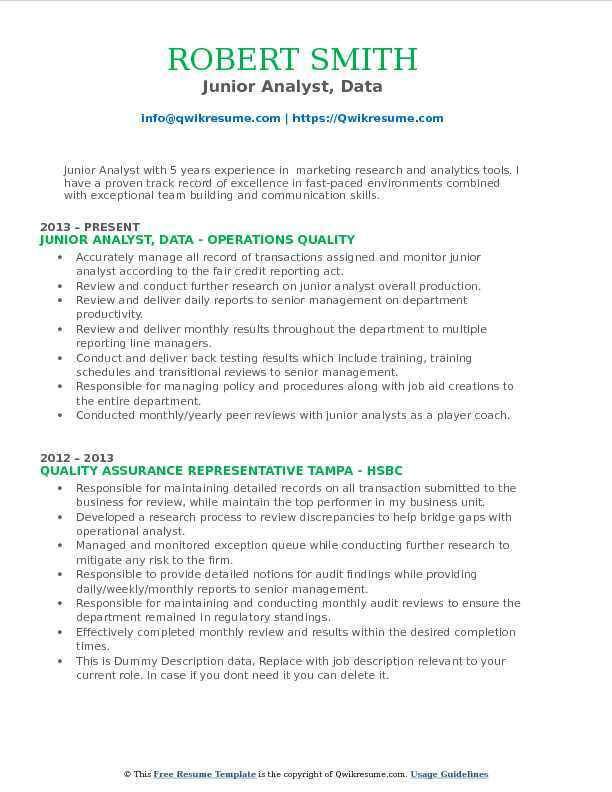 The major job responsibility as a Junior Analyst includes improvement of company’s interpretation of its client’s needs and finding ways to meet them. The organizations always make an attempt to reach customer’s expectations and as a Junior Analyst you analyze the business problems and provide suggestions for improvement. These analysts either work on their own or assist their senior analysts by gathering and documenting information and assist them in preparing reports. 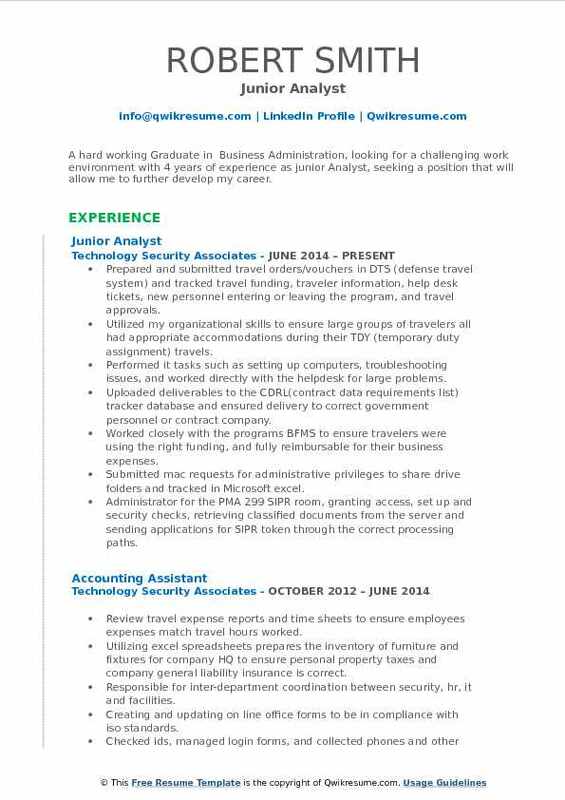 To be a Junior Analyst your education should be at-least of a bachelor’s degree with a firm understanding of technology applications, business strategy, and marketing techniques. 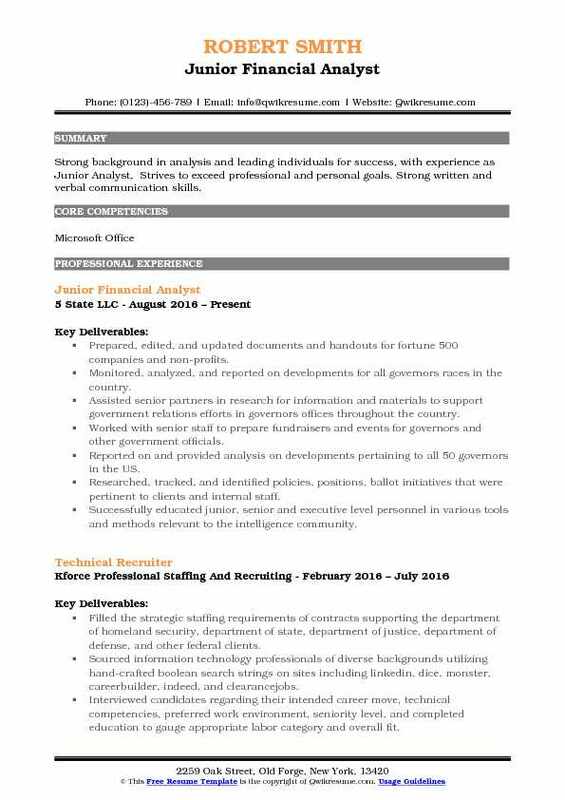 Though there is no set path to be a Junior Analyst, candidates from different subject backgrounds can get into this if you possess the required skills of analytical thinking, quick learning, organizational behavior, computer proficiency and few more than in our for Junior Analyst Resume. 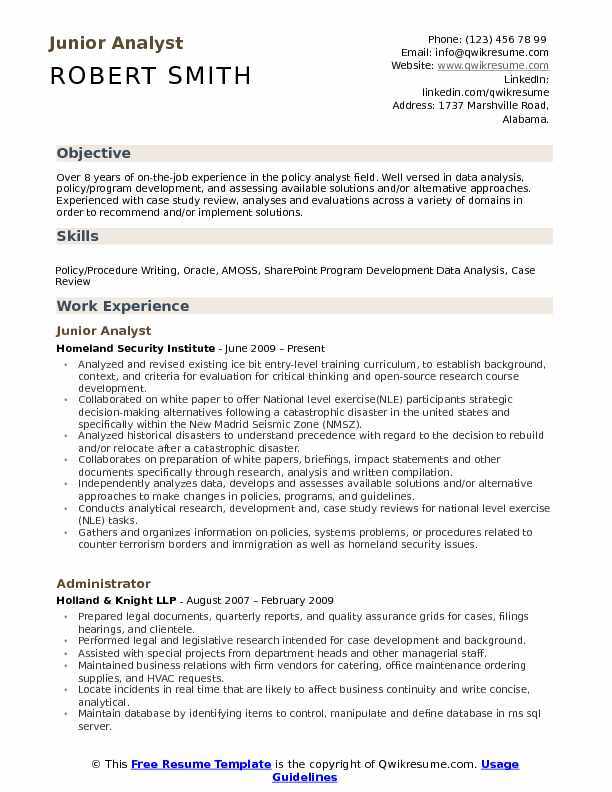 Summary : Over 8 years of on-the-job experience in the policy analyst field. Well versed in data analysis, policy/program development, and assessing available solutions and/or alternative approaches. Experienced with case study review, analyses and evaluations across a variety of domains in order to recommend and/or implement solutions. Analyzed and revised existing ice bit entry-level training curriculum, to establish background, context, and criteria for evaluation for critical thinking and open-source research course development. Collaborated on white paper to offer National level exercise(NLE) participants strategic decision-making alternatives following a catastrophic disaster in the united states and specifically within the New Madrid Seismic Zone (NMSZ). Analyzed historical disasters to understand precedence with regard to the decision to rebuild and/or relocate after a catastrophic disaster. Collaborates on preparation of white papers, briefings, impact statements and other documents specifically through research, analysis and written compilation. Independently analyzes data, develops and assesses available solutions and/or alternative approaches to make changes in policies, programs, and guidelines. Conducts analytical research, development and, case study reviews for national level exercise (NLE) tasks. Gathers and organizes information on policies, systems problems, or procedures related to counter terrorism borders and immigration as well as homeland security issues. Coordinated and executed all logistics for Federal Emergency Management Agency (FEMA) conferences to include administrative and operational support. 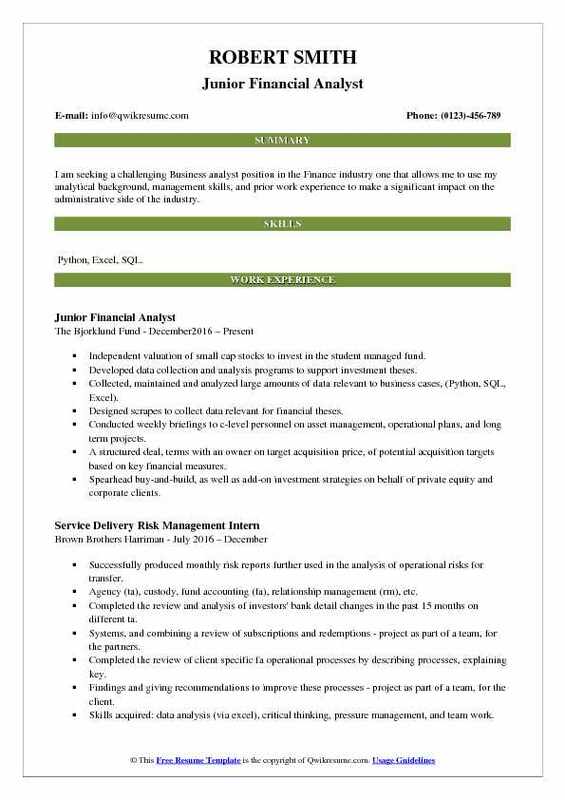 Objective : Seeking a position in a good organization where I can apply the business skills I have acquired as a Junior Analyst and be able to improve the work experience I have gathered in the workplace. Researched, analysed and wrote proposals for local, regional and global business investment opportunities, foreign held investments of the credit union. Managed the credit union's USD fixed deposit investments on behalf of members' investments. Assisted with the coordination and execution of special projects under the purview of the CEO and GM - operations. Prepared reports and proposals for executive management and board of directors meeting on varying aspects of the loan portfolio and membership as deemed necessary by the CEO or GM- operations. Assisted with the assessment of commercial business loans which were to be placed as an investment in the credit union's portfolio. Prepared a new member service training manual for the credit union and assisted management with its subsequent implementation. Provided support to the internal audit department for verification of the Documents prepared in the minutes of the business loans. 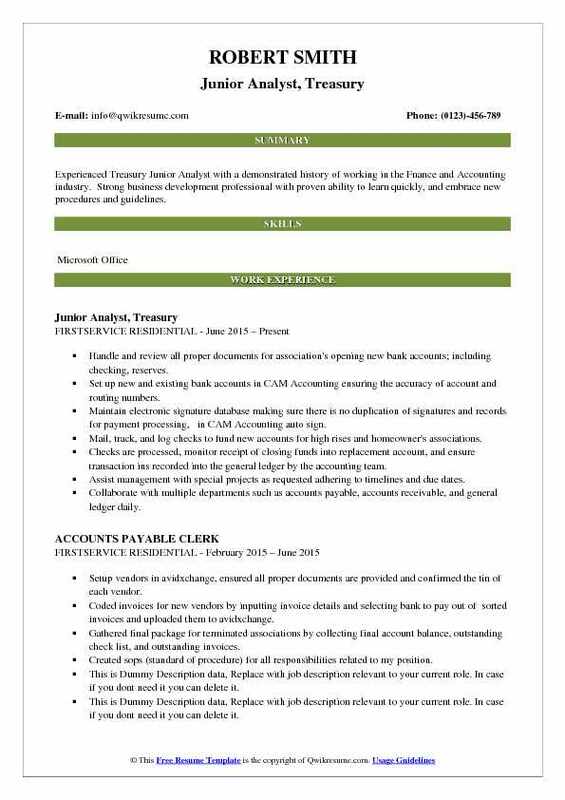 Objective : Experienced Treasury Junior Analyst with a demonstrated history of working in the Fnance and Accounting industry. Strong business development professional with proven ability to learn quickly, and embrace new procedures and guidelines. Handle and review all proper documents for association's opening new bank accounts; including checking, reserves. Set up new and existing bank accounts in CAM Accounting ensuring the accuracy of account and routing numbers. Maintain electronic signature database making sure there is no duplication of signatures and records for payment processing, in CAM Accounting auto sign. Mail, track, and log checks to fund new accounts for high rises and homeowner's associations. Checks are processed, monitor receipt of closing funds into replacement account, and ensure transaction ins recorded into the general ledger by the accounting team. Assist management with special projects as requested adhering to timelines and due dates. Collaborate with multiple departments such as accounts payable, accounts receivable, and general ledger daily. Create (standard of procedure) for all responsibilities related to my position. Objective : A hard working Graduate in Business Administration, looking for a challenging work environment with 4 years of experience as junior Analyst, seeking a position that will allow me to further develop my career. Skills : MS Office Windows XP, Vista Excellent And Speedy Typing , Peach tree, Quick Books. Prepared and submitted travel orders/vouchers in DTS (defense travel system) and tracked travel funding, traveler information, help desk tickets, new personnel entering or leaving the program, and travel approvals. Utilized my organizational skills to ensure large groups of travelers all had appropriate accommodations during their TDY (temporary duty assignment) travels. Performed it tasks such as setting up computers, troubleshooting issues, and worked directly with the helpdesk for large problems. Uploaded deliverables to the CDRL(contract data requirements list) tracker database and ensured delivery to correct government personnel or contract company. Worked closely with the programs BFMS to ensure travelers were using the right funding, and fully reimbursable for their business expenses. Submitted mac requests for administrative privileges to share drive folders and tracked in Microsoft excel. Administrator for the PMA 299 SIPR room, granting access, set up and security checks, retrieving classified documents from the server and sending applications for SIPR token through the correct processing paths. 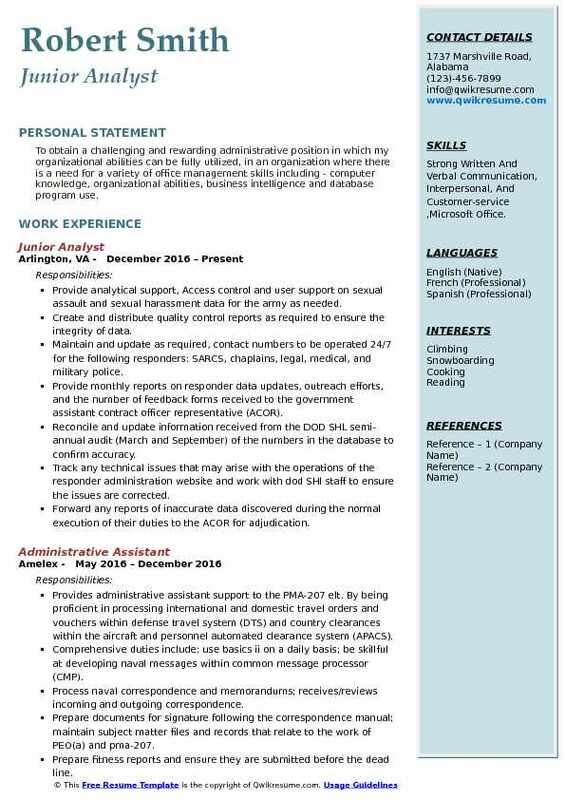 Objective : To obtain a challenging and rewarding administrative position in which my organizational abilities can be fully utilized, in an organization where there is a need for a variety of office management skills including - computer knowledge, organizational abilities, business intelligence and database program use. 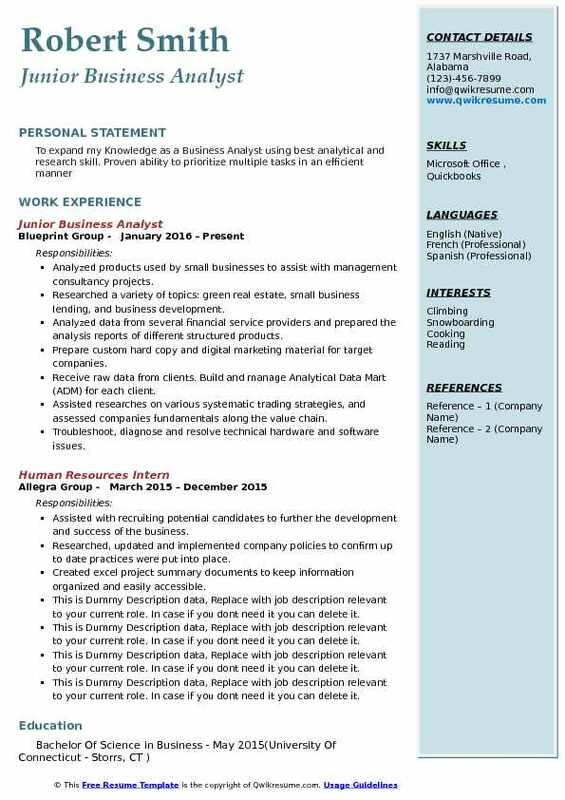 Skills : Strong Written And Verbal Communication, Interpersonal, And Customer-service ,Microsoft Office. Provide analytical support, Access control and user support on sexual assault and sexual harassment data for the army as needed. Create and distribute quality control reports as required to ensure the integrity of data. Maintain and update as required, contact numbers to be operated 24/7 for the following responders: SARCS, chaplains, legal, medical, and military police. Provide monthly reports on responder data updates, outreach efforts, and the number of feedback forms received to the government assistant contract officer representative (ACOR). Reconcile and update information received from the DOD SHL semi-annual audit (March and September) of the numbers in the database to confirm accuracy. Track any technical issues that may arise with the operations of the responder administration website and work with dod SHl staff to ensure the issues are corrected. Forward any reports of inaccurate data discovered during the normal execution of their duties to the ACOR for adjudication. Make updates within 48 hours of e-mail notification to ensure accurate data is available on dod shl to military victims and survivors of sexual assault. Serve as a poc to make necessary updates to dod shl data via the responder administration website. 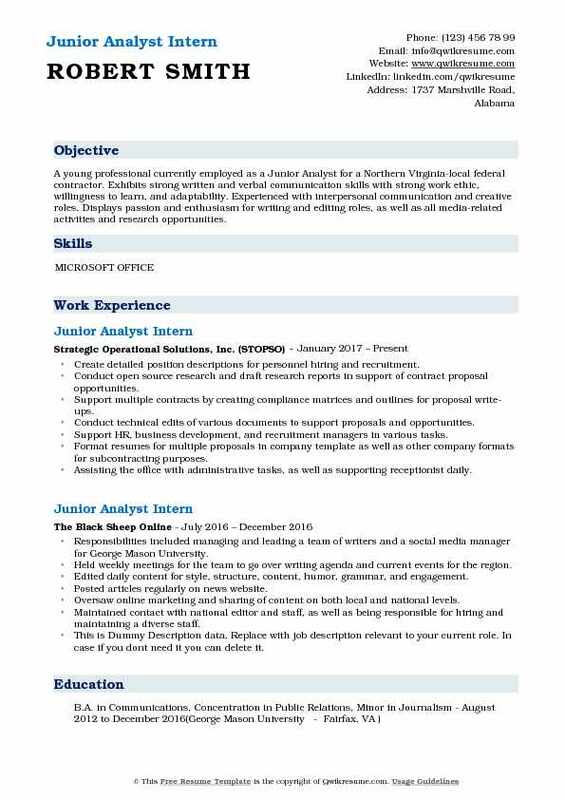 Objective : A young professional currently employed as a Junior Analyst for a Northern Virginia-local federal contractor. Exhibits strong written and verbal communication skills with strong work ethic, willingness to learn, and adaptability. Experienced with interpersonal communication and creative roles, Displays passion and enthusiasm for writing and editing roles, as well as all media-related activities and research opportunities. Create detailed position descriptions for personnel hiring and recruitment. Conduct open source research and draft research reports in support of contract proposal opportunities. Support multiple contracts by creating compliance matrices and outlines for proposal write-ups. Conduct technical edits of various documents to support proposals and opportunities. Support HR, business development, and recruitment managers in various tasks. Format resumes for multiple proposals in company template as well as other company formats for subcontracting purposes. Assisting the office with administrative tasks, as well as supporting receptionist daily. 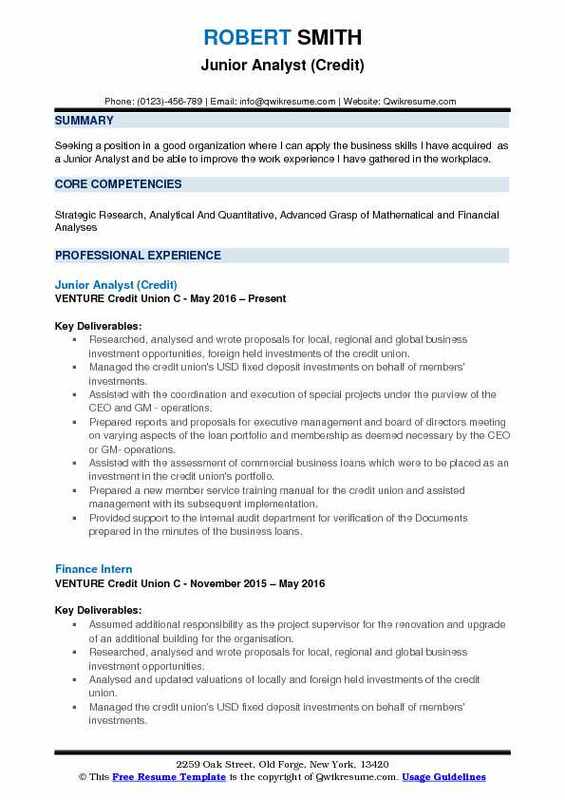 Objective : Junior Analyst with 5 years experience in marketing research and analytics tools. I have a proven track record of excellence in fast-paced environments combined with exceptional team building and communication skills. Accurately manage all record of transactions assigned and monitor junior analyst according to the fair credit reporting act. Review and conduct further research on junior analyst overall production. Review and deliver daily reports to senior management on department productivity. Review and deliver monthly results throughout the department to multiple reporting line managers. Conduct and deliver back testing results which include training, training schedules and transitional reviews to senior management. Responsible for managing policy and procedures along with job aid creations to the entire department. Conducted monthly/yearly peer reviews with junior analysts as a player coach. Objective : Strong background in analysis and leading individuals for success, with experience as Junior Analyst, Strives to exceed professional and personal goals. Strong written and verbal communication skills. Prepared, edited, and updated documents and handouts for fortune 500 companies and non-profits. Monitored, analyzed, and reported on developments for all governors races in the country. Assisted senior partners in research for information and materials to support government relations efforts in governors offices throughout the country. Worked with senior staff to prepare fundraisers and events for governors and other government officials. Reported on and provided analysis on developments pertaining to all 50 governors in the US. Researched, tracked, and identified policies, positions, ballot initiatives that were pertinent to clients and internal staff. Successfully educated junior, senior and executive level personnel in various tools and methods relevant to the intelligence community. 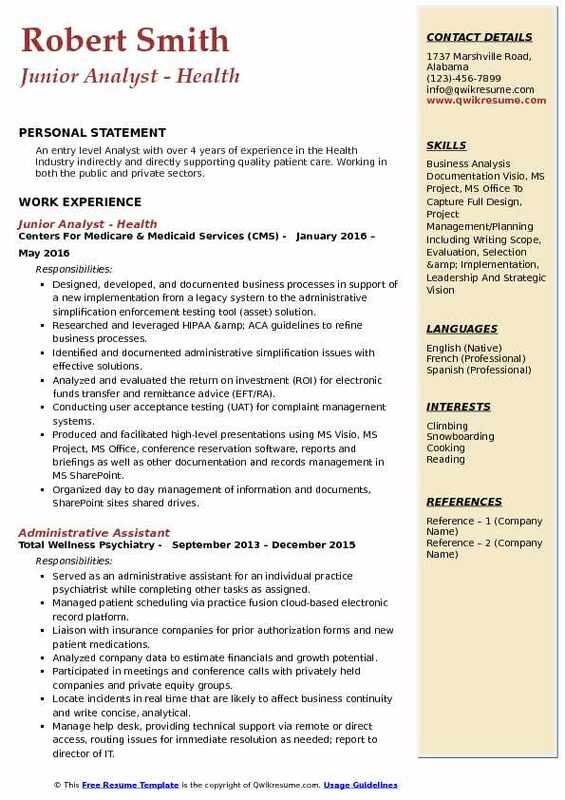 Objective : An entry level Analyst with over 4 years of experience in the Health Industry indirectly and directly supporting quality patient care. Working in both the public and private sectors. Designed, developed, and documented business processes in support of a new implementation from a legacy system to the administrative simplification enforcement testing tool (asset) solution. Researched and leveraged HIPAA & ACA guidelines to refine business processes. Identified and documented administrative simplification issues with effective solutions. Analyzed and evaluated the return on investment (ROI) for electronic funds transfer and remittance advice (EFT/RA). Conducting user acceptance testing (UAT) for complaint management systems. Produced and facilitated high-level presentations using MS Visio, MS Project, MS Office, conference reservation software, reports and briefings as well as other documentation and records management in MS SharePoint. Organized day to day management of information and documents, SharePoint sites shared drives. Skills : Quick Books, Excel, Word, Power Point, MS Visio, Photoshop, Option pricing model. Participated in the development of an options trading strategy based on statistical arbitrage. Developed VBA and excel models that were meant to identify option pricing abnormalities. Developed materials, home assignments, lectured in subjects of options, futures. Monitored positions held portfolio, updated excel sheets with market to market p&l on daily basis. Performed research and data mining exercises, updated risk parameters, sent weekly reports to the di team members. Presented oral and written reports on specific businesses and their entire industries. Assisted numerous market and feasibility studies. 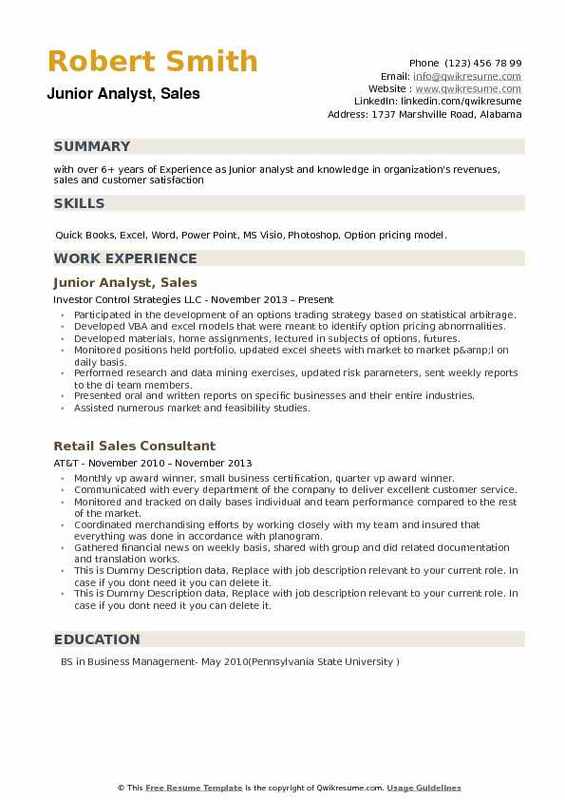 Headline : Detail-oriented mathematics and analytics graduate with strong technical skills and the ability to learn concepts quickly.Worked as a Junior Analyst for a marketing analytics company. Analytic partners deliver results-oriented consulting services (including marketing mix modeling, forecasting, custom analytics). Analyst for the project. Responsible for synthesizing large quantities of scanner, media, and other marketing data. Build marketing models to provide in-depth analysis of consumer buying behavior, competitor activity, and market trends. Present project findings to clients, ensuring clarity and understanding is communicated to manage and deliver on expectations. Collaborate with senior management to deliver strategic insights to enhance market share and profitability for clients at regional and national. Write monthly country specific reports analyzing and forecasting political and security issues for clients. Conduct in-depth market research for suitable companies based on investment. Summary : Exceptional administrative and computer skills with attention to detail, able to multi task while maintaining an orderly office environment a midst a demanding setting. 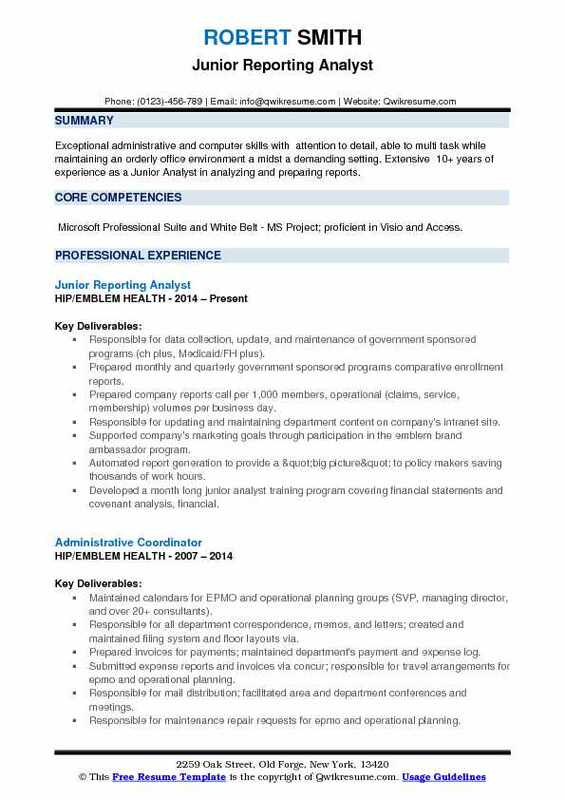 Extensive 10+ years of experience as a Junior Analyst in analyzing and preparing reports. 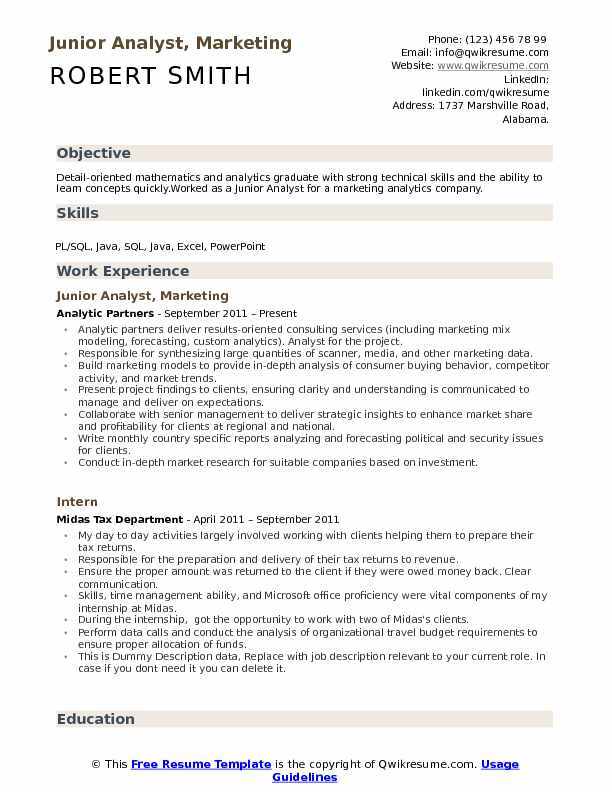 Skills : Microsoft Professional Suite and White Belt - MS Project; proficient in Visio and Access. Responsible for data collection, update, and maintenance of government sponsored programs (ch plus, Medicaid/FH plus). Prepared monthly and quarterly government sponsored programs comparative enrollment reports. Prepared company reports call per 1,000 members, operational (claims, service, membership) volumes per business day. Responsible for updating and maintaining department content on company's intranet site. Supported company's marketing goals through participation in the emblem brand ambassador program. Automated report generation to provide a "big picture" to policy makers saving thousands of work hours. Developed a month long junior analyst training program covering financial statements and covenant analysis, financial. Objective : I am seeking a challenging Business analyst position in the Finance industry one that allows me to use my analytical background, management skills, and prior work experience to make a significant impact on the administrative side of the industry. Skills : Python, Excel, SQL. Independent valuation of small cap stocks to invest in the student managed fund. Developed data collection and analysis programs to support investment theses. Collected, maintained and analyzed large amounts of data relevant to business cases, (Python, SQL, Excel). Designed scrapes to collect data relevant for financial theses. Conducted weekly briefings to c-level personnel on asset management, operational plans, and long term projects. A structured deal, terms with an owner on target acquisition price, of potential acquisition targets based on key financial measures. Spearhead buy-and-build, as well as add-on investment strategies on behalf of private equity and corporate clients. 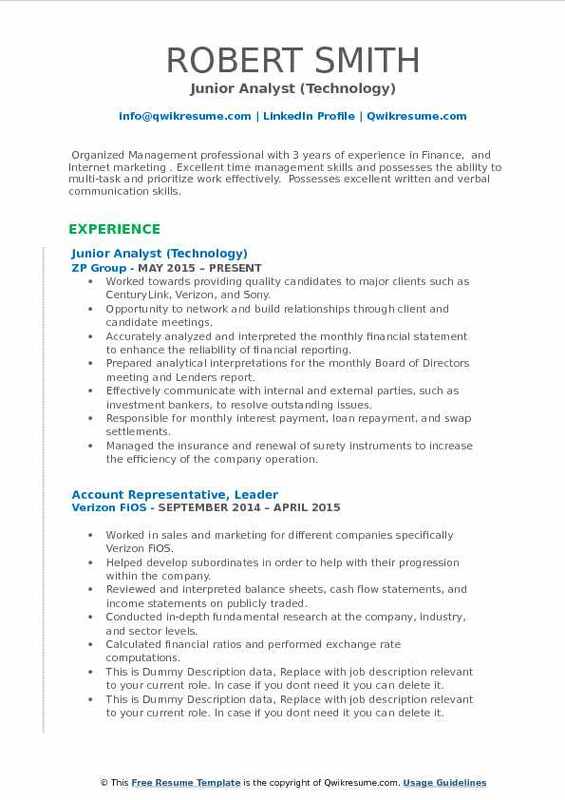 Objective : Organized Management professional with 3 years of experience in Finance, and Internet marketing . Excellent time management skills and possesses the ability to multi-task and prioritize work effectively. Possesses excellent written and verbal communication skills. Worked towards providing quality candidates to major clients such as CenturyLink, Verizon, and Sony. Opportunity to network and build relationships through client and candidate meetings. Accurately analyzed and interpreted the monthly financial statement to enhance the reliability of financial reporting. Effectively communicate with internal and external parties, such as investment bankers, to resolve outstanding issues. Responsible for monthly interest payment, loan repayment, and swap settlements. Managed the insurance and renewal of surety instruments to increase the efficiency of the company operation. Analyzed products used by small businesses to assist with management consultancy projects. Researched a variety of topics: green real estate, small business lending, and business development. Analyzed data from several financial service providers and prepared the analysis reports of different structured products. Prepare custom hard copy and digital marketing material for target companies. Receive raw data from clients. Build and manage Analytical Data Mart (ADM) for each client. Assisted researches on various systematic trading strategies, and assessed companies fundamentals along the value chain. Troubleshoot, diagnose and resolve technical hardware and software issues.